In 2018, the BLPS rolled out the Shoreland Stewardship Program. In doing so, Black Lake joins a long list of differentiated lakes in our state that are part of this program. More than any other, this program is at the heart of the goals of the BLPS. The health of our lake is simply a reflection of the treatment of the land surrounding the lake. The BLPS can only impact what we, the property owners, renters, and visitors choose to do with our land and our behaviors and we enjoy the rich, natural, common asset that is Black Lake. In 2018, the BLPS rolled out background information that members can use to prepare for the self assessment and gain an appreciation for the importance of the questions. We registered with the program and began tracking how many people from our lake participate. We offered references for support for our members as they plan and execute improvements on their properties. All BLPS Directors have gone through the assessment, and we will tell you that it is a high quality learning tool. The BLPS has three goals for this program in 2019. The first is a recognition program for those that go through the self assessment process. The second is to enable a local contractor to offer "living shoreline" strengthening solutions in place of seawalls (that simply deflect erosion to other properties as opposed to reducing damage from erosion. 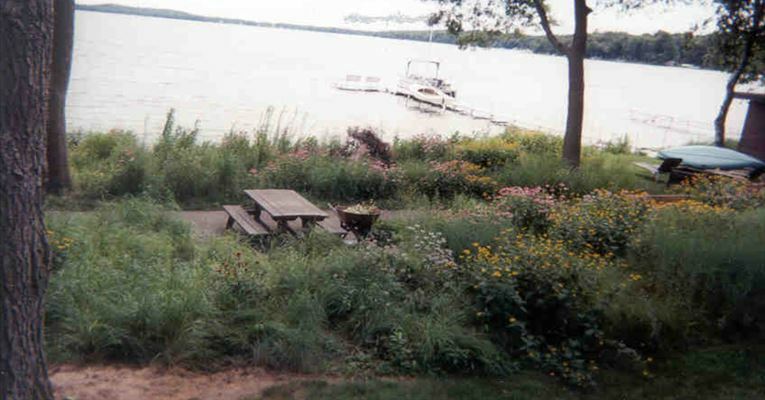 The third is to offer free shoreline vegetation design advice and planning services. As members complete this self assessment, the BLPS will provide a "license plate" for mounting on a dock or mailbox. This plate will show that this property is a Shoreland Steward Property, and hopefully generate interest in others to join in. In addition, those that re-take the assessment and show an improved score (honor system as no one will see your results! ), the BLPS will make a drone video of your lake home from above! Toward the second goal, the BLPS intends to provide financial incentive to a local contractor to attend a living shoreline training program so we can have ready access to top notch capabilities in shoreline protection. And our third objective will be met by introducing members to an expert from the Tip of the Mitt Watershed Council, Jennifer Buchanan, who is an expert with native plants and sustainable and natural shoreline strengthening. We will offer a demonstration and workshop on a Black Lake property that will be engaging and will provide access to Jennifer Buchanan's ongoing assistance. The BLPS has budgeted $1,200 this year to defray contractor training costs ($500), provide recognition plates to stewards ($400), and for supplies and refreshments for the shoreline design workshop. ($300).